Suede After Shave is a custom blend aftershave and cologne with organic aloe vera, witch hazel and natural glycerin to be used by men or women after shaving. Suede After Shave is a custom blend aftershave and cologne with organic aloe vera, witch hazel and natural glycerin to be used by men or women after shaving. The blend is a complex fragrance with citron, bergamot, leather, patchouli violet, birch, sweet tobacco, amber, cedar, tonka bean and oakmoss. It can also be used as a cologne as the scent lasts. The witch hazel helps to close pores for less irritation and less ingrown hairs, glycerin adds moisture and organic aloe juice soothes the skin. A light touch of menthol cools the skin after wet shaving. My unique formula helps reduce redness, irritation and ingrown hairs. 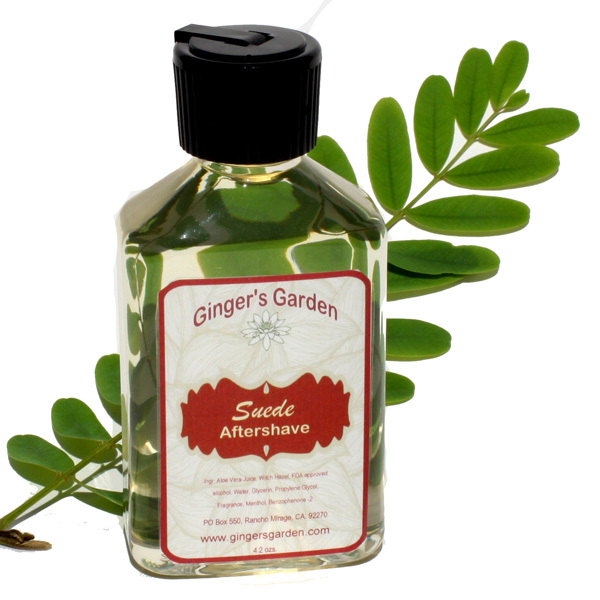 Suede is the number one scent in all of Ginger's Garden products. It is available as a vegan or tallow based shaving soap, an aftershave balm and a cologne.